This summer, Red Dirt Studio hosted two awesome Cranbrook artists, Christina Osheim and Matthew Kerkof. Join them for a one night only exhibition, artist talk and party,“RAD DIRT”, at the culmination of their residency. It is at events like this where one really feels and discovers what makes the DMV art scene pop and vibrate. 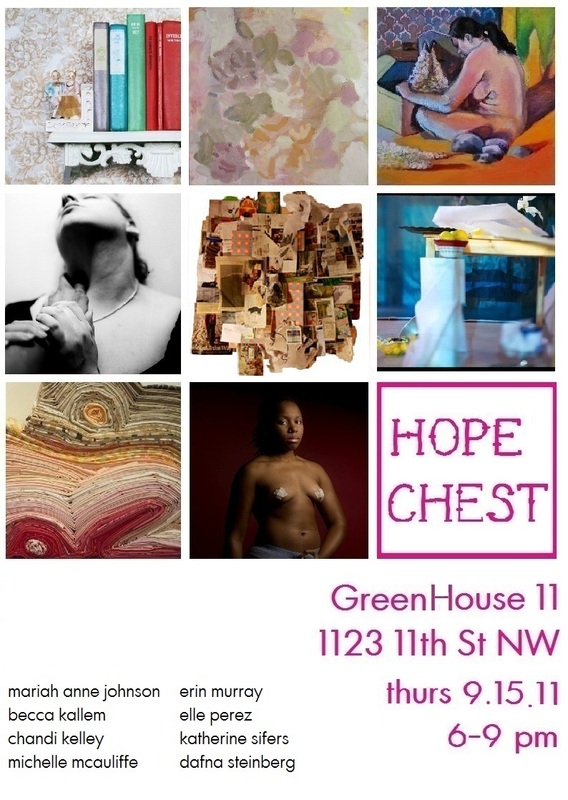 HOPE CHEST: a young woman's accumulation of clothes and domestic furnishings (as silver and linen) kept in anticipation of her marriage; also : a chest for such an accumulation. 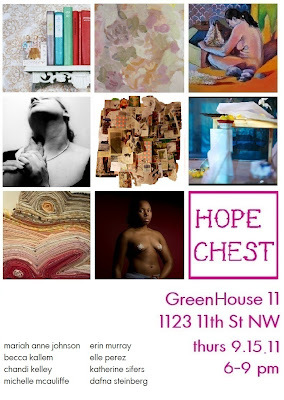 This is a special event featuring artwork by DC/Baltimore artists Mariah Anne Johnson, Becca Kallem, Chandi Kelley, Michelle McAuliffe, Erin Murray, Elle Perez, Katherine Sifers, and Dafna Steinberg. These emerging artists "challenge and reinvent tradition, romance, gender roles/expectations, and sexuality. Their work also investigates what we keep, save, and treasure in contrast to what is discarded. Photography, installations, mixed media work, and paintings present the domestic, nostalgic, and personal in new contexts." Work on view September 15 - November 15 by appointment. A special event will be held on September 24 to coincide with Shaw's NUIT BLANCHE Art All Night and the (e)merge art fair.